^ John C. Prevost, Le Dandysme en France (1817–1839) (Geneva and Paris) 1957. ^ Charles Baudelaire, Le Peintre de la vie moderne, IX. 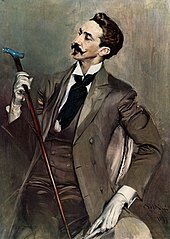 Le dandy, Calmann Lévy, 1885 (Œuvres complètes de Charles Baudelaire III. L’Art romantique, pp. 91-96). ^ Oxford English Dictionary. Oxford University Press. (1989). http://dictionary.oed.com. "dandy 1.a. One who studies above everything to dress elegantly and fashionably; a beau, fop, 'exquisite'. c1780 Sc. Song (see N. & Q. 8th Ser. IV. 81), I've heard my granny crack O' sixty twa years back When there were sic a stock of Dandies O; Oh they gaed to Kirk and Fair, Wi' their ribbons round their hair, And their stumpie drugget coats, quite the Dandy O." ^ 10,000 Famous Freemasons from K to Z. Books.google.com. (30 September 2004). https://books.google.com/books?id=dZbjtGC48-8C&pg=PA247&lpg=PA247&dq=joachim+murat+%22dandy+king%22&source=web&ots=JDwyaDnJ4Y&sig=q6GB320S3gY6cw38PPIlA-BuwHg&hl=en 2013年2月16日閲覧。. ^ Camus, Albert (2012). “II Metaphysical Rebellion”. The Rebel: An Essay on Man in Revolt. Knopf Doubleday Publishing Group. p. 51. ISBN 9780307827838. https://books.google.com/books?id=t_3yQrhdxwUC&pg=PA51 2014年10月11日閲覧。. Lytton, Edward Bulwer, Lord Lytton. Pelham or the Adventures of a Gentleman. Edited by Jerome J. McGann. Lincoln: University of Nebraska Press, 1972. Nicolay, Claire. 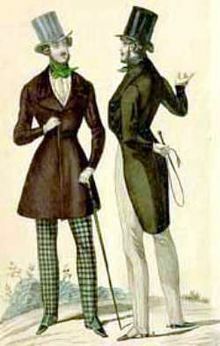 Origins and Reception of Regency Dandyism: Brummell to Baudelaire. Ph.D. diss., Loyola U of Chicago, 1998.